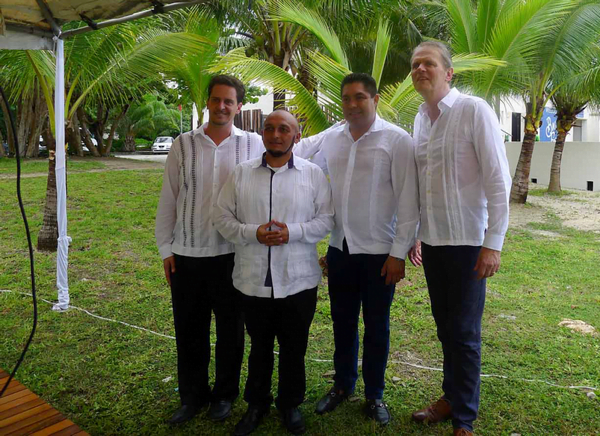 The ceremony took place in Chankanaab beach adventure park in Cozumel at about 17.30 on Thursday 28th July 2017. 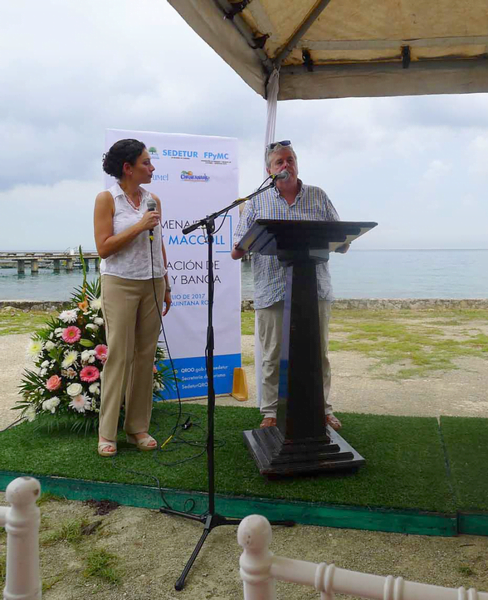 The under-secretary for tourism in Mexico was there as well as the minister for tourism for Quintana Roo, the region in which you find Cozumel and Cancun. There were also representatives of the governor of Quintana Roo and the British ambassador to Mexico Duncan Taylor and his wife Beatrice. Everyone was very nice. 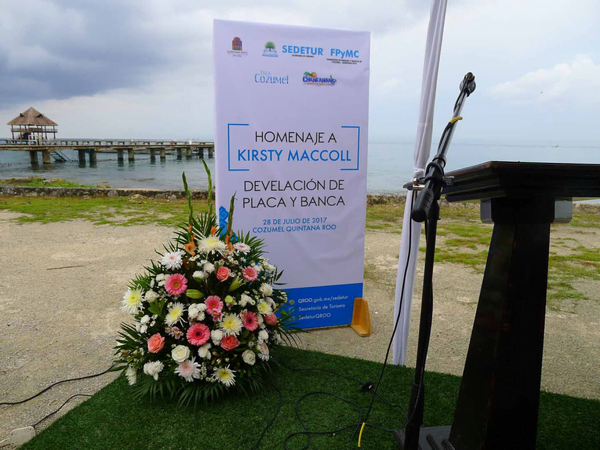 While the last governor had shown no interest in helping at all the new governor, Carlos Manuel Joaquin Gonzalez, had immediately offered his help when told of Kirsty’s story and it was his help that really got things moving. The scene was set in the park. A marquee roof (too hot for walls), several rows of chairs, a pa system and a podium and a small stage. The bench was hidden behind curtains. They played “in these shoes” which sounded just right. A young lady introduced each of the speakers who took it in turn to say a few words. I did my bit which was difficult. Then I went with the Ambassador and we pulled the cord that drew back the curtains to reveal the bench. The quote and Kirsty’s drawing of a bird are very touching. All of this took place in a temperature of 39C and 95% humidity. Mum would have been very happy. She heard that this ceremony was going to happen a week before she died. It was almost as though she was hanging on for this moment. Well, a thank you to all the fans who have supported the campaign, you kept us going . . . and a thank you to my indomitable mum. 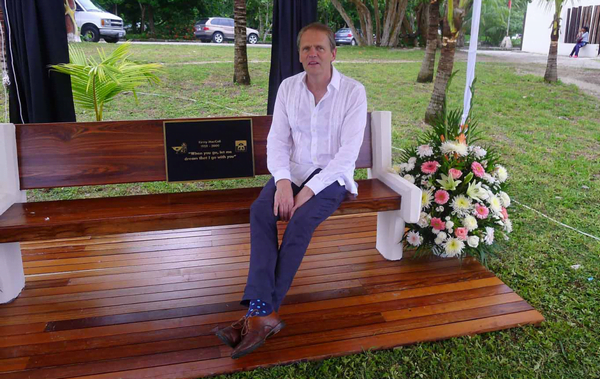 Duncan Taylor, photographed on a bench in Cozumel . . . will you be next? The bench looks great and I think the inscription works really well. 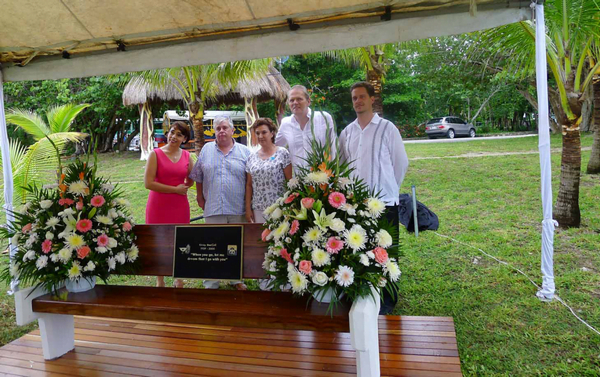 Very happy that at last there is some formal memorial to Kirsty in Cozumel. I must admit I had started to doubt it would ever happen, so great credit to all concerned. Following on from my earlier comment, could someone please tell me who was who, in the photos, that attended the Kirsty memorial bench ceremony? Thank you for the photos and description of what must have been a very emotional occasion. 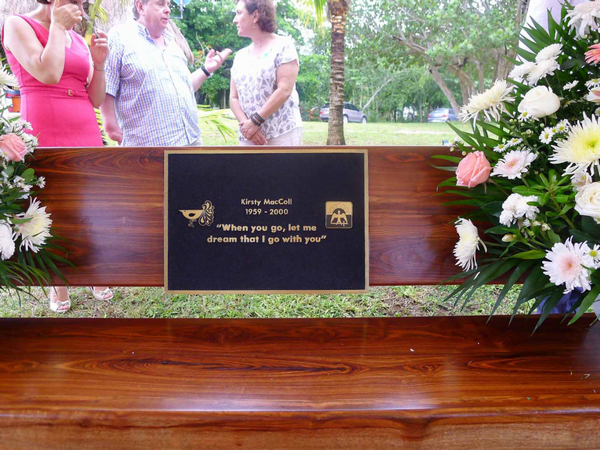 The bench looks btiful and I’sure Jean would have been delighted with this permanent reminder of Kirsty. RIP to one of the great music artists of my lifetime. 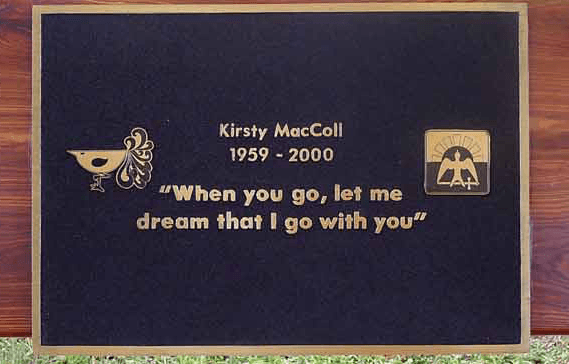 Thank you for a wonderful way of keeping the memory of such an awesome woman as Kirsty , for all to enjoy. I’a fan of Kirsty and I always will love her and her work. She was truly talented. It’s a btiful tribute and I am so happy that she is being honoured in this way. A btiful tribute to a btiful woman. Great work to Hamish and all involved. Wonderful news. Well done to everyone who helped make it happen.